Slices for Twitter is a new Twitter app with a gorgeous design, tons of features, speed and responsiveness. Slices lets you browse a Twitter directory by category, easily follow live events, slice your timeline into manageable streams, bookmark favorite accounts, and synchronize with a web experience (available soon). 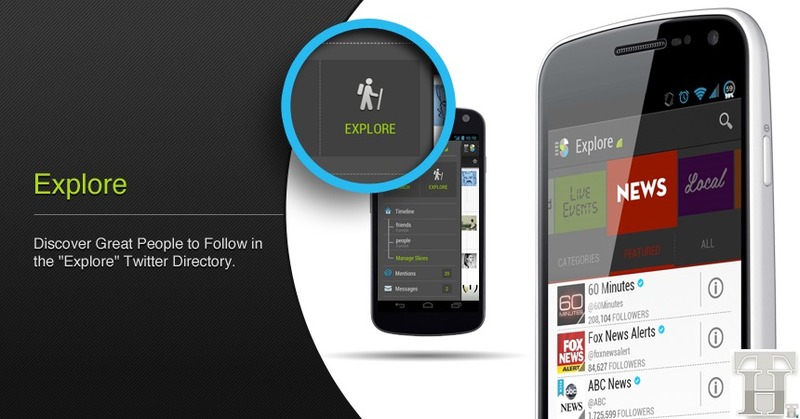 Finding New People : Slice gives you the real Explore directory of all of Twitter. With 21 searchable categories, finding people and lists to follow is astonishingly easy and fun. Live Events : Only Slices has Live Event streams, finally making it easy to follow live events on Twitter. Each stream displays a feed of tweets from the “right” people. Timeline Slicer : Another exclusive feature, the Timeline Slicer helps you organize your timeline into “Slices”. These are mini-feeds that you define, so that you can read what you want, when you want it. Bookmarks : With Slice, you can bookmark favorite Twitter accounts or lists for easy access. Mobile-to-Web : Slices lives on your iPhone, Android phone AND the Slices.me website. All your actions are automatically synchronized. No struggle to find where you left off, or notifications of messages/mentions that you have already seen. Ability to add unlimited # of Twitter accounts and post to Facebook etc. Slices app is available for Android, iPhone and soon it will be available online too at slices.me. Previous story Spotify Launches Pandora killer for Android – Free Mobile Radio For U.S.